Beauty sleep is not just a myth - night time is when our skin renews and repairs, so what we put on it is important! There is no SPF or makeup to compete with so the products we use can really get to work. Being the skincare junkie that I am, I have a number of products that I love to use and I want to share them with you today. For reference, I have dry skin with some areas of texture that is prone to being dull if I don't keep on top of my skincare routine! Antipodes Joyous Serum: I raved about Antipodes Aura mask last week (here) and now it's the turn of Joyous Serum or Joyous Protein-Rich Night Replenish Serum to give it its full title! This serum has a silky/oily texture but it absorbs easily and quickly. It is comprised of goji berries, which contain 19 Amino Acids, Raspberry Seed Oil, Blackcurrant Fruit Oil and a host of other Vitamins and Omegas. These combine to nourish and deeply hydrate the skin, leaving it plumped and radiant. The only thing I don't particularly like about this serum is the scent, but as I have said previously, I can always get over a scent if a product works well, as this does - plus it is an all natural product so I would prefer it to smell how it does rather than have an artificial scent added. I use this at night after cleansing and toning, before moisturiser and a little goes a long way. Estée Lauder Advanced Night Repair: My number one skincare product, which I have consistently repurchased since I first tried it around 10/11 years ago. This is a wonder product that hydrates, repairs, heals, nourishes, calms, plumps and brightens the skin. It is only with consistent use that you will see results but over time, skin looks clear, plump and more elasticized. Omorovicza Midnight Radiance Mask: I adore this mask because it gives overnight results. It contains Salicylic Acid, which deeply penetrates the pores to dissolve blackheads, exfoliate and reduce inflammation. It also contains Red Algae and Sodium Hyalyronate, both of which lock moisture into the skin. When I apply this at night, I wake to clear, smooth and radiant skin with refined pores and less texture. It is definitely one to use before a special event as you look like you've just had a facial when this is used! Alpha-H Liquid Gold Rose: The gentler sister to the original Liquid Gold, this product has all of the exfoliating benefits of the original but with the added benefit of the moisturising properties of rose, lotus and orchid petal extracts as well as the anti-inflammatory benefits of Scandinavian Red Algae. This is the one to choose if you have dry or mature skin as the glycolic acid will renew and brighten the skin but without the dryness that can also result. 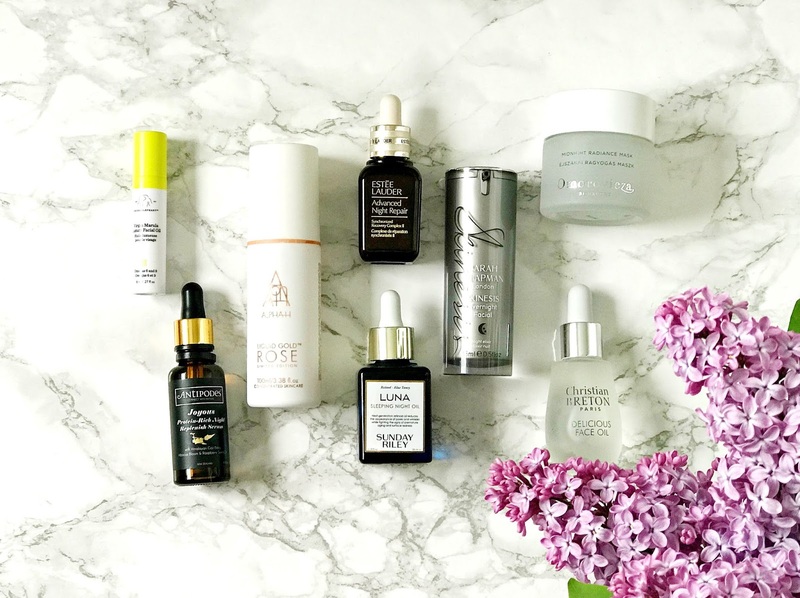 Sunday Riley Luna Sleeping Night Oil: My favourite retinol treatment by far as it doesn't irritate my sometimes reactive skin but it really does make a difference in terms of pore visibility, texture and elasticity. Only a few drops are required twice weekly and although blue in colour, this disappears when it is massaged into the skin. Pricey, but worth it! Sarah Chapman Overnight Facial: This really is magic in a bottle. Silky in texture, this product nourishes, brightens, calms and plumps the skin. A few drops are all that is required and I know that I am guaranteed a very good skin day the morning after using this. My only complaint is the measly 15ml that the bottle contains - I'd expect 30ml for the price but I can get over that because it is so good! Christian Breton Delicious Face Oil: I love a good face oil and will often use one as a last step just before I hop into bed, to seal all of my other products in. This oil is suited to dry skin and it contains Camellia Extract, Baobab Extract, Sunflower Seed Extract, Soy Extract and Vitamin E. All of these ingredients combine to intensely nourish the skin, yet the texture of the oil is quite light and it absorbs quickly. Fine lines are diminished, skin is more elastic to the touch and looks calm overall when I use this oil. A little goes a long way so I expect this 30ml bottle to last at least 6 months. Another beautiful product from this brand. Drunk Elephant Luxury Marula Oil: Another oil option that I love is this offering from Drunk Elephant, which I bought in Sephora in March, but will be available in the UK later this year. This oil is completely natural and is suitable for all skin types, particularly dry as it is intensely nourishing. I've noticed that when I use this, my fine lines are diminished, my skin looks plump and has a glow to it that can be difficult to achieve on naturally dull skin. I'm looking forward to buying a full size when they launch on this side of the Atlantic later in the year. What do you most love to use on your skin at night? Have you tried any of these products or have any caught your eye? I'd love to hear! All products are bought by me, unless otherwise stated. The Antipodes serum and Christian Breton oil were kindly sent to me. Opinion is always my own.